You are going to visit an international virtual area. We organize 60 virtual classes dedicated to collaborative learning. The basis of the project is to make students work together using a language which is for none of them their native language. eTwinning V2CL makes students learn together since September 1999. 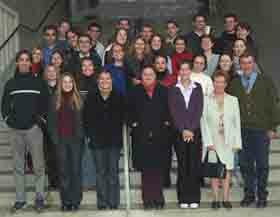 The WKTO virtual class project has lasted 10 years, from September 1999 to March 2010. It has given the opportunity to 8000 pupils to work together and to improve their skills in a foreign language. May all the people who took part in this international activity be thanked.